Part of 1960s high society, Liliana went on vacation in Austria when she was 26. She & her husband couldn’t return as planned because winter snow had been exceptionally heavy & roads were blocked. 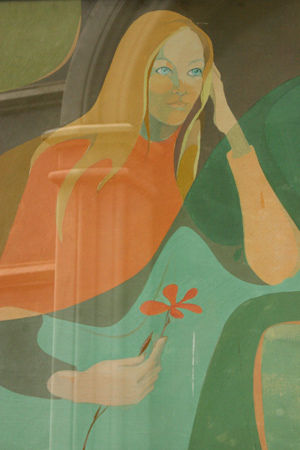 On an early February morning in 1970, an avalanche covered the hotel where she was staying. The force of the snow broke several windows & filled most of her room. Liliana was found on her bed covered in blankets but only lived a few hours after her rescue. Death was attributed to lack of oxygen & exposure to severe cold. So where does the mystery come in? 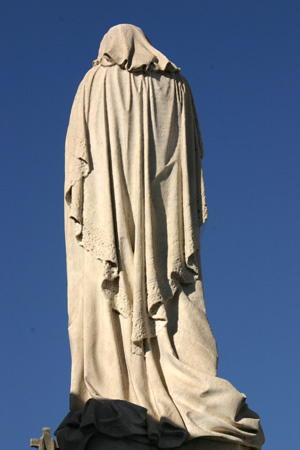 There seem to be more versions of Liliana’s tragic death than even Rufina Cambacérès can claim. No one mentions what happened to her husband. Did he die in the avalanche? If not, where is he now? 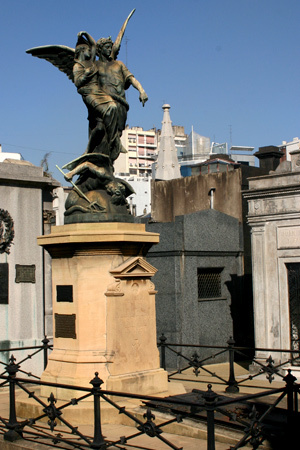 Some people say that Sabú died in Buenos Aires on the same day as Liliana. Doubt it. 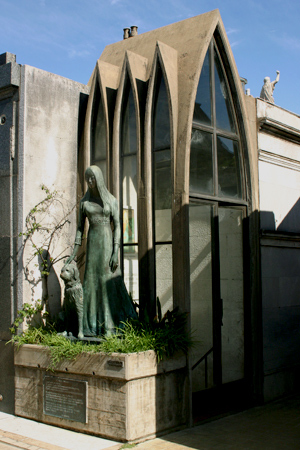 Others say that Sabú passed away earlier but was Liliana’s favorite pet, hence his place with her for eternity. 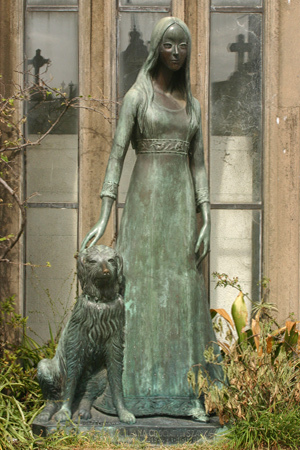 There are even tales of Sabú being added later to the statue… highly unlikely given the position of Liliana’s hands. 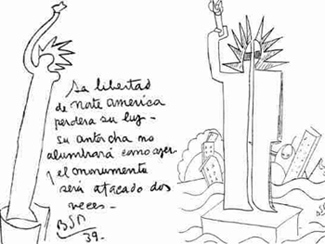 And apparently to add more tragedy, some versions of the story say that Liliana was on her honeymoon & the garment she wears in the statue is her wedding dress. What’s the real scoop? Someone in the family must still be alive to set the record straight. 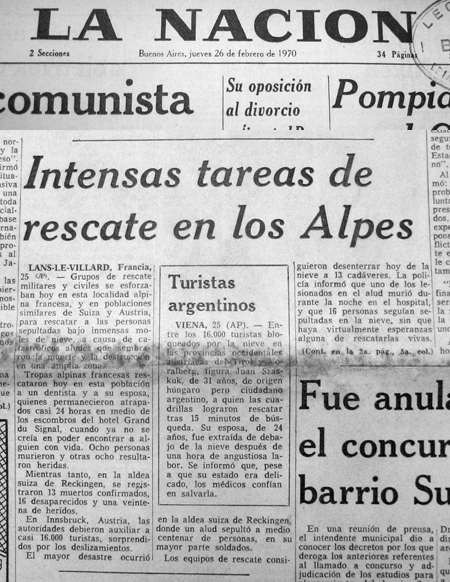 Otherwise, a look through 1970s microfilm of Buenos Aires newspapers might hold a few clues. At least avalanche.org corroborates part of the tragedy; from February 19-24, 1970 a series of avalanches in St. Sigmund im Sellrain near Innsbruck claimed four fatalities. One of those must have been Liliana. 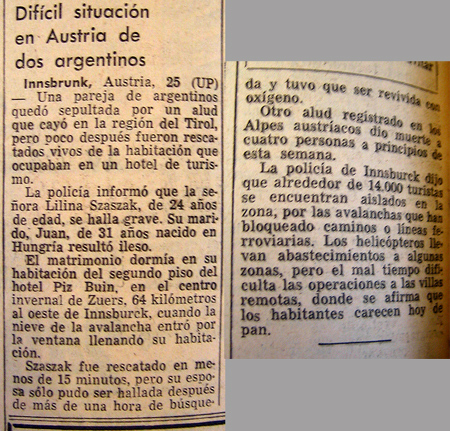 Difficult situation in Austria for two Argentines—Innsbruck, Austria, 25 (UP) An Argentine couple was buried by an avalanche which happened in the Tirol region but shortly after were rescued alive from the hotel room they occupied. Police informed that Mrs. Liliana Szaszak, 24 years old, is in critical condition. Her husband, Juan, 31 years old born in Hungary was not injured. The couple slept in their third floor room at the Piz Buin hotel in the Zuers winter resort, 64 km west of Innsbruck, when the snow from the avalanche entered through the window & filled their room. Szaszak was rescued in less than 15 minutes, but his wife could only be found after searching for one hour & had to be revived with oxygen. Update (23 Jun 2017): Public records can reveal amazing things. Thanks to a reader who requested to remain anonymous, we now have family photos from a 1954 trip to Brazil to share. Since these are not private documents, I decided to publish them for anyone who is interested. 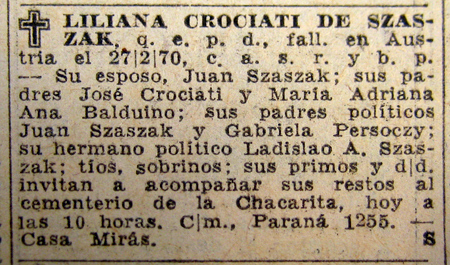 Below are Liliana’s parents, Guiseppe Crociati & Maria Adriana Balduino de Crociati, as well as Liliana when she was 11. I’ve also emailed the tourism information office in Zuers to see if they have any information about the avalanche from local sources. 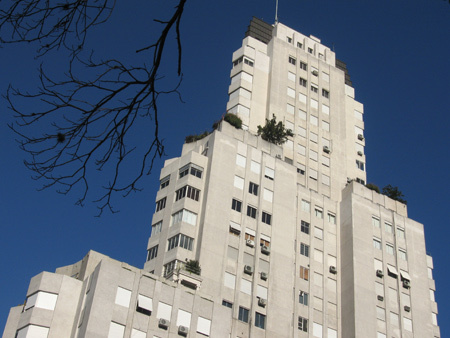 As one of the most important architects in Argentine history, Benoit is not recognized for the sheer number of buildings he constructed but instead for designing a city completely from scratch. 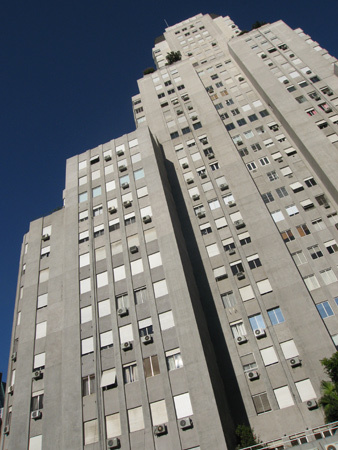 Given the opportunity of a lifetime, Benoit was awarded the commission by Dardo Rocha to build the capital of the Province of Buenos Aires. If Benoit’s accomplishments weren’t enough, his father claimed to be the Dauphin—the last Bourbon king of France. Since the French Revolution it was widely believed that Louis XVII, son of Louis XVI & Marie Antoinette, was secretly removed from prison at a young age & a sick boy replaced him who later died. 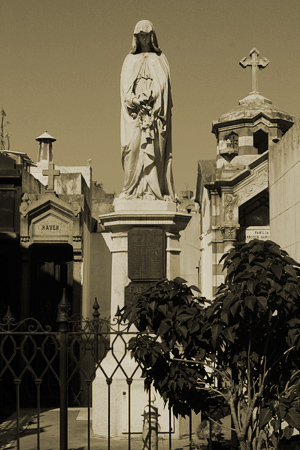 By way of Haiti, Louis XVII arrived in Buenos Aires under the pseudonym Pierre Benoit in 1818. Maybe. Maintaining his supposed royal past a secret, Benoit served in the Argentine Navy, married, & had two sons… one of them named after him: Pedro Benoit. One day Pedro’s father received a childhood friend from France. Immediately afterwards, Benoit was noticeably shaken & his health took a turn for the worse. No one knows what was said between the two, but Pierre Benoit died within 24 hours. On his deathbed, he confessed to be Louis XVII. That would make Pedro, the architect son of Pierre, French royalty. Maybe. Only recently has the fate of Louis XVII been settled. “The Lost King of France” by Deborah Cadbury (2002) chronicles the French Revolution & closely examined events afterwards. After the autopsy of the sick boy in prison, his heart was removed & kept by a doctor with royal sympathies. 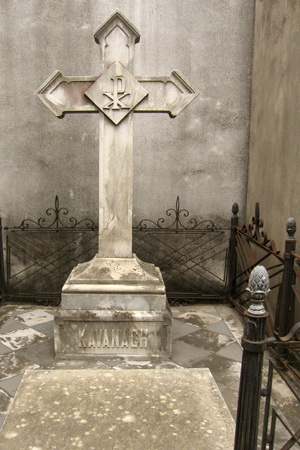 Recently submitted for DNA testing, the heart proved to be of the same lineage as Marie Antoinette… confirming that the boy who died under horrible conditions in solitary confinement was indeed Louis XVII. No child had been substituted for the real Dauphin. Regardless, Pedro Benoit is a legend in his own right for good urban planning… royalty or not. The vault was declared a National Historic Monument in 1983. On a winter morning in 1881, Felisa Dorrego de Miró received an unexpected letter at the family mansion in Buenos Aires. 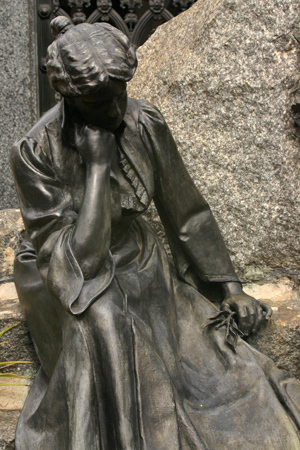 Full of eloquent prose & apologies, Felisa read that the cadaver of her recently deceased mother had been stolen from Recoleta Cemetery & a ransom of 2 million pesos was demanded in 24 hours for its return. Shocked & in spite of threats not to involve the police, Felisa reported the theft. 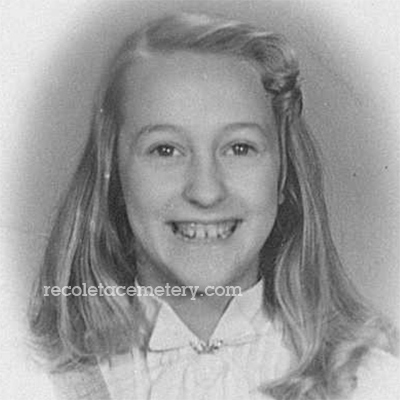 A big, bulky coffin would have been impossible to sneak out without someone noticing, so police deduced the casket must have been hidden somewhere inside the cemetery. 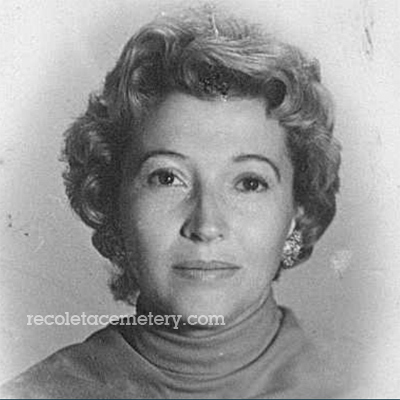 Sure enough, a nearby tomb with a broken chain had the coffin of Felisa’s mom stuffed inside. With part of the mystery solved, the police captured the entire gang by paying the ransom & following the trail. The culprits were bored upper-class “gentlemen” looking for a bit of adventure. Unfortunately no punishment existed on the books for the crime committed. Each member recevied two years in prison for related violations of the law, & in response a new law was added. 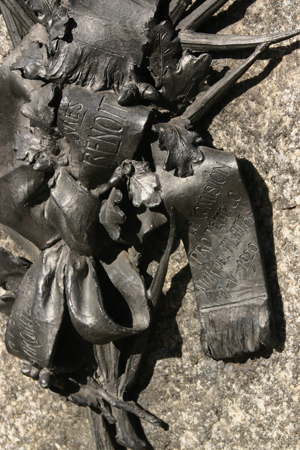 Article 171 of the Argentine Penal Code still states that a sentence of 2 to 6 years will be given to anyone who steals a cadaver & demands a ransom for its return. Seriously. Born in La Rioja, Quiroga received the nickname “Tiger of the Plains” based on his adeptness in battle. It was a skill needed during the troubled times of early independence from Spain when Argentina struggled to reach a consensus on national government. When Argentina broke away from Spain & earned its independence in 1816, some people wanted to invite a European monarch to establish their own kingdom… sort of an Empire of the Río de la Plata. The idea isn’t far-fetched since Brazil was a separate Portuguese empire at the same time. But those in favor of a monarch didn’t have the majority. The biggest issue centered on the role of Buenos Aires in the new nation, specifically the money it received from port taxes. 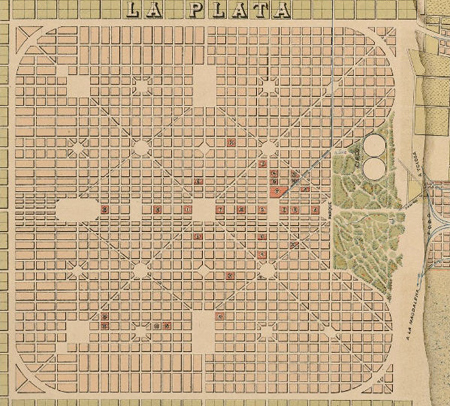 Unitarios wanted Buenos Aires to become the capital city & keep all revenue from international trade. Opposing federales wanted a confederation—an alliance among equals—which would commit Buenos Aires to give other provinces access to their income. Definitely a touchy issue. As the major port of the nation, foreign trade brought lots of money into Buenos Aires & exporters wanted to maintain the status quo. By placing the national capital in the same spot as the economic center, Federalists feared that the rest of Argentina would be neglected. 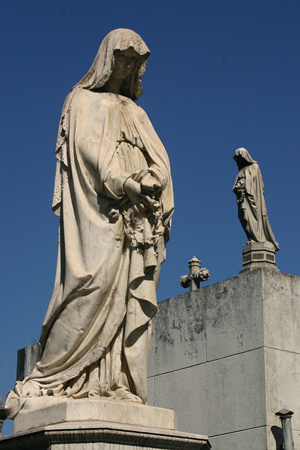 In the end, the struggle over Confederation vs. Republic was settled in favor of Buenos Aires. Unitarian predictions came true as national growth has been skewed toward the capital ever since. A strong supporter of BsAs, Quiroga thought that Rosas could resolve the conflict & pledged his support. 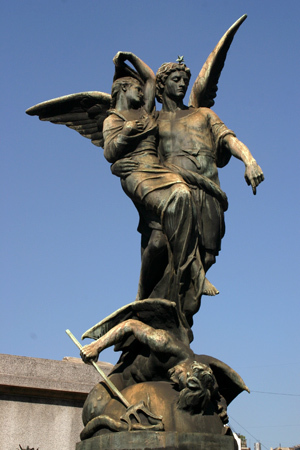 But when Rosas began ruling Argentina like a monarch, Quiroga switched sides. 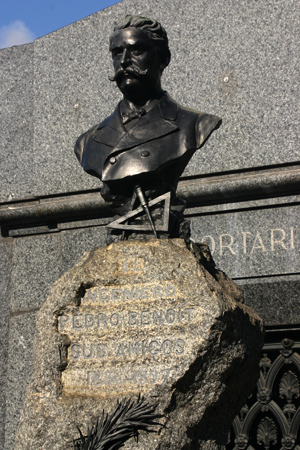 Ignoring warnings of a conspiracy against his life, Quiroga was ambushed & killed in central Argentina. 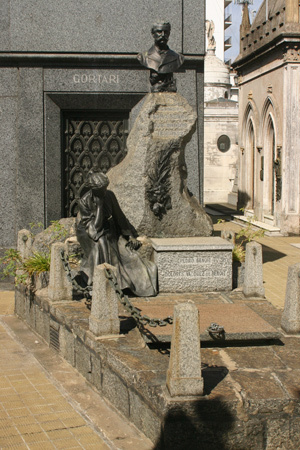 Eventually his remains were transferred to Recoleta Cemetery. 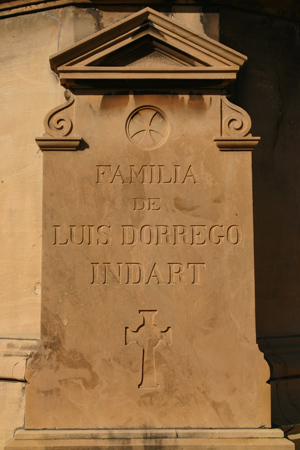 Legend claimed that the coffin of Quiroga was buried upright, perhaps so he would be one of the first out during the Second Coming of Christ. Excavations in 2004 confirmed his fate… Quiroga was indeed buried upright, hidden behind a wall underground. He was controversial enough that family & friends were afraid someone might break into the cemetery to deface his remains. Sure, it’s gruesome, but that’s one way to have the last word… when your opponent can’t fight back. What inspired Corina to fund the construction? 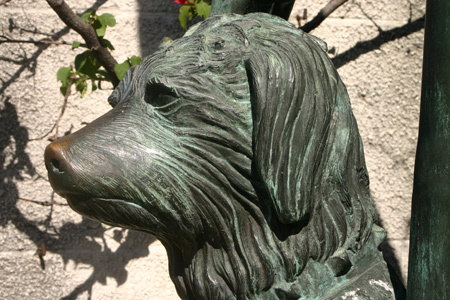 A legend exists that Corina fell in love with a son of the Anchorena family whose palatial residence also borders Plaza San Martín. But mom didn’t approve & made sure that her son broke it off with Corina. 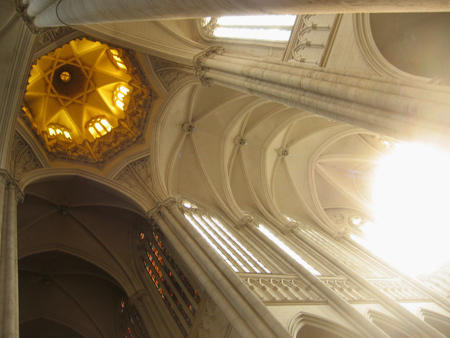 Wanting revenge, Corina bought land in front of the Basílica del Santísimo Sacramento (meant to be the family mausoleum for the Anchorenas) & had the Kavanagh built so tall that the family wouldn’t be able to look out their windows to see the church. Sounds good but a little too good to be true. 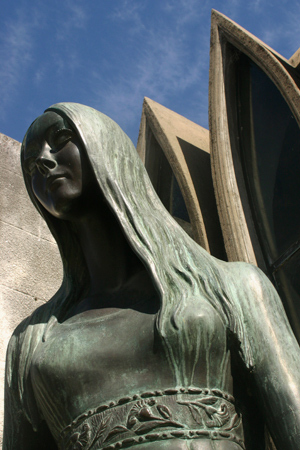 Since the Anchorena mom died in 1920 & the Kavanagh was built in 1936, the story is most likely someone’s invention. 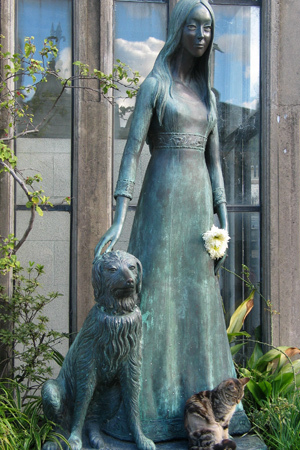 Corina passed away in 1984. 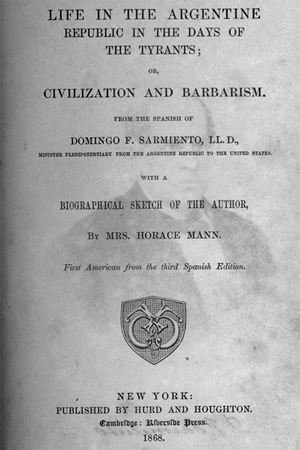 While the Parravicini tomb may not be the most elaborate, Benjamín made some astonishing predictions about world events. 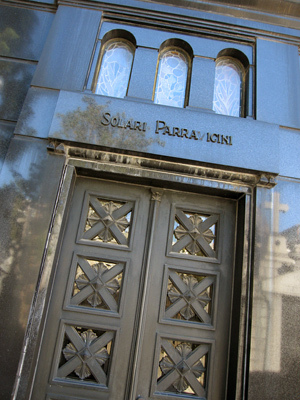 Whether you’re a believer or not, Parravicini is recognized as Argentina’s most accomplished psychic. 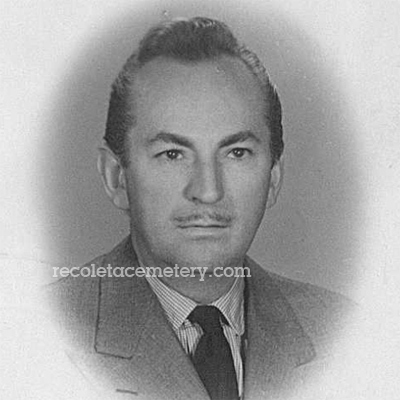 Born in 1898, Parravicini was surrounded by paranormal events his whole life. But in the 1930s he began to receive messages… he compared it to someone whispering in his ear. These voices guided him in something he termed “psychographies”—sketches drawn without any conscious thought. Devoutly Catholic & horrified by his apparent gift, he destroyed many of these drawings. But quite a few survived & a large percentage have become true. Events that Parravicini predicted include the development & use of the atomic bomb, the invention of television, the Cold War & even cloning. Intrigued? Doubtful? More biographical information & further predictions can be found here. Many of the events to come concern aliens: the discovery of an alien base on the dark side of the moon, alien visitors coming to obtain sea algae they need for food, & aliens will cure all of mankind’s diseases. It’s a much friendlier type of contact than “War of the Worlds” or “Independence Day” would have us believe.